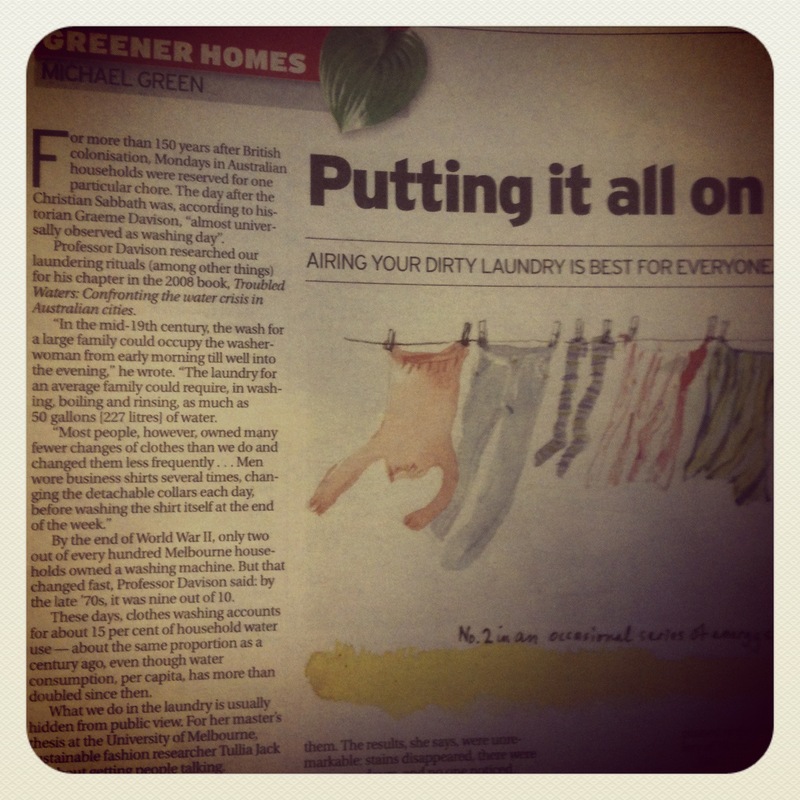 Eco Journalist, Michael Green wrote a piece about laundering in last weekend’s The Age newspaper, mentioning my Nobody was Dirty research. Often I get emails after such pieces, and I am always very interested to hear what people think about some of the ideas. This time I received an email from Kate Brown, who very generously shared some of her thoughts about drying clothes, below is a copy – we would both love to hear what you think. My passion is to help people understand what a waste clothes dryers are. Obviously they are a huge drain on power, overused and inefficient as a means of drying clothes. They damage clothes and radically shorten their lifespan. In a country like Australia with abundant natural heat and light, there is absolutely NO NEED to use a clothes dryer. I’m sure you would agree. We have three young children and also both wear corporate clothes to work. My husband’s hobby involves dirt and grime and mine involves sweaty gym gear. So there is plenty to wash if we want to. Here are my strategies- probably nothing new to you, but just thought I’d pen them anyway. 1. Clothes drying racks that hoist up to the ceiling taking the clothes out of the way and taking advantage of the warm air rising. We have sufficient rack for three loads of washing. 2. Outside washing lines- sufficient for three loads of washing so we can wash on sunny windy days and get clothes dry. 3. Front loader- less water. 4. Spot cleaning clothes to reduce washing and (worse) dry cleaning. The Enjo Laundry Fibre is amazing at removing spots on clothes and blotting the moisture so you can keep on wearing them. Normally I think Enjo is overpriced and over prescribed but this little pad is incredible and will hopefully last a lifetime. 5. Air freshening of clothes to see if they really need a wash- often not. In Germany where many smoke and they wash clothes less often, it is common to have a little line somewhere handy (in front of a window) to air freshen a jumper or jacket. I’ve never seen that here. 6. I wash clothes at 40 or 30 degrees. I know you prefer cold water, but I find it doesn’t sufficiently clean women’s underwear, sports clothes, nappies, baby possit and kitchen towels. To do that cold you need detergents that are too strong. However, there is no need to wash any hotter than 40 degrees, in fact it will damage clothes. I know plenty of people who wash at 50-60 degrees and their kids handy-me-downs are not worth having as they are too damaged. My son’s clothes all get a second or even third go with another family as they leave here is good condition. 7. Detergent is over-used. Choice Magazine experimented and found you could effectively use 25% of the prescribed amount of OMO to clean clothes. I use about half the prescribed amount of Amway and it is enough. 8 New fabric technologies creating self wicking sports clothing which needs washing very infrequently. I have Lululemon sportstops which I an wear repeatedly. This entry was posted in my work, Nobody was Dirty and tagged Dryers, Drying, Kate Brown, Laundry, Michael Green, Nobody was Dirty. Bookmark the permalink.